You may not be spending your holiday in Rio de Janeiro this year, but you can have a bit of its tropical flair and color in your home or on your patio. 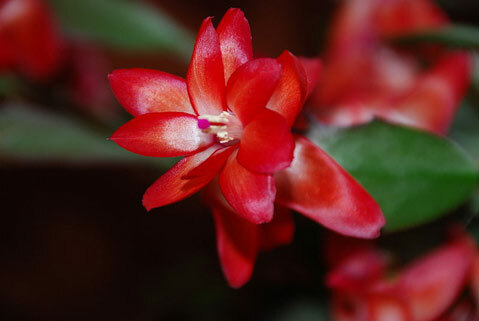 The ever-popular Christmas cactus (Schlumbergera species and hybrids) is a native of that region and is plenty happy to cover itself in blooms year after year even this far north of its home. In Brazil, it is an epiphyte, growing on the branches of forest trees with minimal roots to hold it fast. As a garden specimen, with a little care, it can become many-branched and almost shrubby. The plants themselves have flattened and jointed stems that are just smaller than an inch across. Their edges are smooth, but slightly scalloped and-the best part of all-spineless. The bright tubular flowers dangle at the ends of the slightly arching branches, so are displayed to advantage in pots on stands or as hanging planters. The old standby, Schlumbergera X buckleyi (also sold under the name S. bridgesii) bears flowers of a lovely magenta hue. Horticulturists have been up to their usual tricks, of course, and there are now a couple hundred different varieties in many colors from pure white through pale pink and deep burgundy. I read that there is even one that appears yellow under heated conditions, but is pink when cool. Like any cactus, these require a fast-draining soil mix. Make your own of equal parts coarse sand, peat moss, or ground fir bark and compost, or buy a bagged cactus mix. Fertilize with a liquid fertilizer at half strength every two weeks or so. One trick to ensure that buds set in time for your holiday decorating is to put the plant in a place where it will be assured of a minimum of 12 hours of darkness each night for at least a month. Many gardens will be dark enough, but if you live under a street light or leave the porch light on overhead, move it to a darker place for the required time to trigger flower production. Cool nights are also best; cooler than 55 degrees is ideal. Easy to propagate, they also make good gifts to share with others once yours is big enough to root some cuttings.